This volume comprises 34 essays from leading scholars in history, classics, philosophy, and political science to illuminate Greek and Roman political thought in all its diversity and depth. 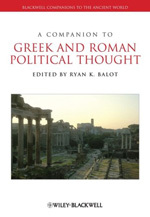 It offers a broad survey of ancient political thought from Archaic Greece through Late Antiquity. Approaching ancient political philosophy from both a normative and historical focus, this text examines Greek and Roman political thought within historical context and contemporary debate. It also explores the role of ancient political thought in a range of philosophies, such as the individual and community, human rights, religion, and cosmopolitanism.